Grand Opening. We could go after certain anti-consumerist directions and treat the shopping as unnecessary thing, as something that keeps us apart from the right values in life but the facts say that the shopping centers are visited every day by numerous people. And if you ask those people how do they feel when they o shopping, they would say that they feel really happy and satisfied. Tricia and Bruce feel really excited at this moment because today it will be a big day for them! They work as shop assistants in the biggest shopping center in their city and today is the grand opening of the center. All the citizens from the town are willing to be present at this opening, but also they like to buy something from the shopping center. This means that there will be a lot of work for Tricia and Bruce, seriously a lot! So, since those two know their job really good, you might say that they will be prepared for the opening of the shopping center but believe us, there will be a huge crowd of people at the opening. And each one of these costumers would like to be treated as he/she is the only one in the particular shop. You will play this game as Tricia and Bruce’s colleague and together with them you will have to serve all the costumers that are here. It would be a lot of work for you too but we are sure that together you will manage to handle that. 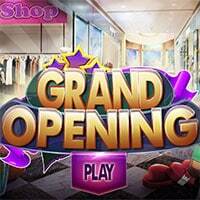 Grand Opening is a free online hidden object game on Hidden4Fun.